Buffy's big Monster of the Week is...the internet. I couldn't even make this up. Come along, have a few laughs, and join us in rewatching "I, Robot... You, Jane". I love a good flashback, but I never found Moloch to be terrifying. He's only shown in demon form for three minutes, and even then, not much is explained about him. How does he corrupt people? Does he have a special ability? Was he the biggest enemy yet? Giles and Jenny Calendar knew about him, and the monks were forced to trap him. However, he seems pretty common. Not a big challenge, except for being in the internet. Did anyone have major flashbacks seeing the retro computers/tech devices? We can't forget this is a '90s show. The technology has changed so much since then. Everything in Buffy the Vampire Slayer Season 1 Episode 8 is dated by today's standards. From the big computer monitors to landline modems, this is the equivalent of a time capsule. As a person who's childhood was in the 90s, it brought back so many memories. Giles: I'm just gonna stay and clean up a little. I'll be back in the middle ages. Jenny: Did you ever leave? Permalink: I'll be back in the middle ages. I've missed Jenny Calendar! She's so sassy and she loves picking on Giles. They always had great chemistry. Jenny is probably one of the biggest early recurring characters on Buffy the Vampire Slayer. You'll see why on Buffy the Vampire Slayer Season 2. She plays a big part in the Angel storyline. Until then, however, she's teased as a potential love interest for Giles. She's modern. He's classic. This is the best part of when opposites attract. Moloch being scanned, and trapped, on the internet was an interesting idea at first. Sure, we know demons are trouble enough and they're pretty supernatural. We just never see them involved in technology. Demons and viruses have a lot of comparisons. I just wish the tie-in wasn't Moloch. As I mentioned above, his corrupting ability is never explained. Is he only doing this in Sunnydale? Is he creating a cult around the world?! And furthermore, does this mean computers have the same reading powers as humans? If spells are scanned into computers, will they be enacted too? I'm probably overthinking this. Help me. It's great to see Willow having feelings for someone else. She should be happy and in love. At this point, Xander is only hurting her. Though, I agree with Buffy. Willow shouldn't have fallen so quick without seeing a photo of Malcolm first. This is Online Dating 101! Speaking of, where did Willow meet Malcolm? Did she sign on to a special chat room? The plot questions are nagging me so much here. Willow: His name is Malcolm Black. He’s 18, lives in Elmwood, which is about 80 miles from here, and he likes me. Buffy: Short? Tall? Skinny? Fat? Willow: Why does everything have to be about looks? Buffy: Not everything, but some stuff is. I mean, what if you guys get really really intense and then you find out that he...has...a hairy back?! Willow: Well, no. He doesn’t talk like somebody who would have a hairy back. And anyway, that stuff doesn’t matter when you really care about each other. Maybe I’m not his ideal either? Buffy: Hey, I’m just trying to make sure that he’s good enough for you. I think it’s great you met someone. Permalink: He doesn’t talk like somebody who would have a hairy back. It's a shame Dave and Fritz were so easily character-stereotyped. At its bare state: Dave was the shy geek and Fritz was the tech villain. Obviously, I liked Dave from the start. The red flags that popped up in my mind every time Fritz was on screen was enough to light a club. He screamed villain. It was too on-the-nose. On the other hand, I liked the "Big Brother 1984" connection here with Moloch and their characters. 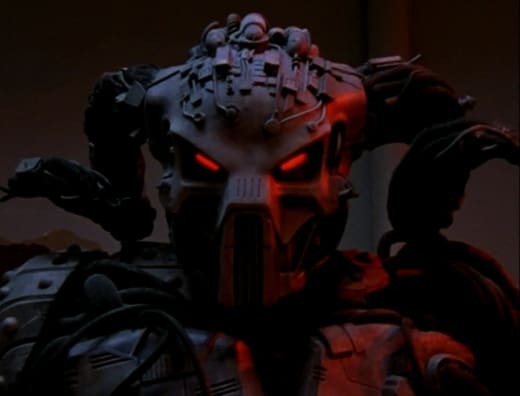 Moloch monitoring and viewing everything the Scoobies did, and then sending orders to Fritz/Dave to enact was fun. Not realizing someone is watching is creepy enough. This is just the tip of the iceberg for what Moloch was probably doing everywhere else. I'm not going to be harsh on Xander this time. Hidden away in his jealously, he truly was worried about Willow. I'll give him that. He did have a fair point about Malcolm. Willow's new boyfriend could've been ANYONE. Buffy the Vampire Slayer Season 1 Episode 8 was pretty early on in the internet's life. Being cautious of who people pretend to be online is a big life lesson to learn. It's something I learned because of Buffy. Xander: I mean, sure, he says he's a high school student, but I can say I'm a high school student. Xander: Okay, but I can also say that I'm an elderly Dutch woman. Get me? I mean, who's to say I'm not if I'm in the elderly Dutch chat room? Buffy: I get your point. I get your point! Oh, this guy could be anybody. He could be weird, or crazy, or old or...he could be a circus freak. He's probably a circus freak! Xander: Yeah, I mean, we read about it all the time. You know, people meet on the net, they talk, they get together, have dinner, a show. Horrible ax murder. Buffy: Willow...ax murdered by a circus freak. Okay...okay, what do we do? What are we doing? Xander! You get me started. We’re totally overreacting. Xander: But that’s fun, isn’t it? Permalink: Okay, but I can also say that I'm an elderly Dutch woman. How big is Sunnydale? I feel like this town continues to retcon itself and grow. As it was mentioned in Buffy the Vampire Slayer Season 1 Episode 1, this is a one Starbucks town. However, now it has a big bankrupt tech company that nearly employed most of the town. That's not something small to miss. Don't get me wrong, I like Sunnydale and its many future beaches, harbors, deserts, and attractions. It's the town that keeps on growing. However, a little consistency would be nice. Buffy: Whatever Dave is into, it’s large. Giles: What is the name of this place? Buffy: It said “C.R.D.” I couldn’t get close enough to see what it was. Xander: It’s Calax Research and Development; it’s a computer research lab. Third largest employer in Sunnydale until it closed down last year. Xander: What?! I can’t have information sometimes? Giles: It’s just somewhat unprecedented. Permalink: It’s just somewhat unprecedented. It's a shame to see Dave die. He tried to make amends and save Buffy in the end, but it was too little too late. I blame Fritz! He's a monster. Speaking of, why is Moloch pretty quick to kill his own followers? He killed Carlo in the beginning, he orders Dave's death now, and he kills Fritz later on. Followers don't come in an endless supply. He's a bit trigger-happy with his death orders. When I had originally watched "I, Robot... You, Jane", I didn't expect this to be part of his plan. With endless knowledge to his disposal, he could've found a way out of the computer. He didn't need a robot body. His fascination with Willow is perplexing. He is an all-powerful being with control over the internet. But, yet he's obsessed over this one high school student? Moloch/Malcolm must've really liked Willow. Until he tried to kill her too, of course. Jenny knowing about the supernatural/demonic world isn't surprising. She seemed bright and self-aware. There was definitely more to her than meets the eye. Her being a "techno pagan" was an eyebrow-raised moment for me. It seemed like a cover for her being a witch or an arbitrary title back then. Though, it may have been me as a child not really sure what any of that meant. Giles: Are you a witch? Jenny: I don’t have that kind of power. “Techno Pagan” is the term. Giles: There are more of us than you think. Permalink: “Techno Pagan” is the term. When Giles and Jenny conducted the incantation, it reminded me so much of inputting code into a computer. Seriously! Look past all the flashing lights, the spell words, and the smoking of the computer...it was like reprogramming a computer. They (dramatically) got rid of a virus. Moloch being trapped in his robot body was perfect justice. It's very similar to the witch of Buffy the Vampire Slayer Season 1 Episode 3. For such a dangerous demon, he wasn't too difficult to beat. A little electricity and some dating puns...that's not too bad. I'm glad he was cut short. Though, I'm still curious about his affect around the world. Did he create followers outside of Sunnydale? Were they still loyal to him after he died? The best moment of "I, Robot... You, Jane" has to be the fountain scene. The Scoobies's chat perfectly sums up living on a hellmouth. Nothing will ever be normal to them again, even their love lives. Which is already messed up to begin with. Willow: The one boy that’s really liked me and he's a demon robot. What does that say about me? Buffy: That doesn't say anything about you. Buffy: Hey, did you forget? The one boy I've had the hots for since I moved here turned out to be a vampire. Xander: Right, and the teacher I had a crush on? Giant praying mantis. Xander: Yeah, that's life on the hellmouth. Buffy: Let's face it. None of us are ever gonna have a happy, normal relationship. Permalink: Let's face it. None of us are ever gonna have a happy, normal relationship. It could be the blinders of being in high school or dealing with supernatural beings all the time, but this is the first they were faced with real reality. The dim, cold reality. It's rough. And anyone who has dated nowadays in the app world can totally relate. After watching this, I basically felt like, "Same." Here's my favorite quote of Buffy the Vampire Slayer Season 1 Episode 8 to lighten up the mood. Buffy: Besides, I can just tell something's wrong. My spider sense is tingling. Buffy: Pop culture reference. Sorry. Permalink: My spider sense is tingling. What did you think of "I, Robot... You, Jane"? Did anyone in the school care Dave was found hanging? What other trouble did Moloch cause around the world? Did anyone else have the same computer? Want to join us in rewatching Buffy the Vampire Slayer? We'll be posting new rewatch posts every Tuesday and Thursday. Come back here and share your thoughts in the comments.